A 23-year-old African native male patient presented with fever, lumbalgia and dysuria after returning from a trip to Togo. His physical examination revealed pain over the pubic symphysis and rectal tenderness on digital exam. The C-reactive protein (CRP) level was elevated along with positive blood and urinary cultures for methicillin-resistant Staphylococcus aureus. An magnetic resonance imaging that has been performed to rule out arthritis/osteomyelitis in the pubis revealed edema of the symphysis. 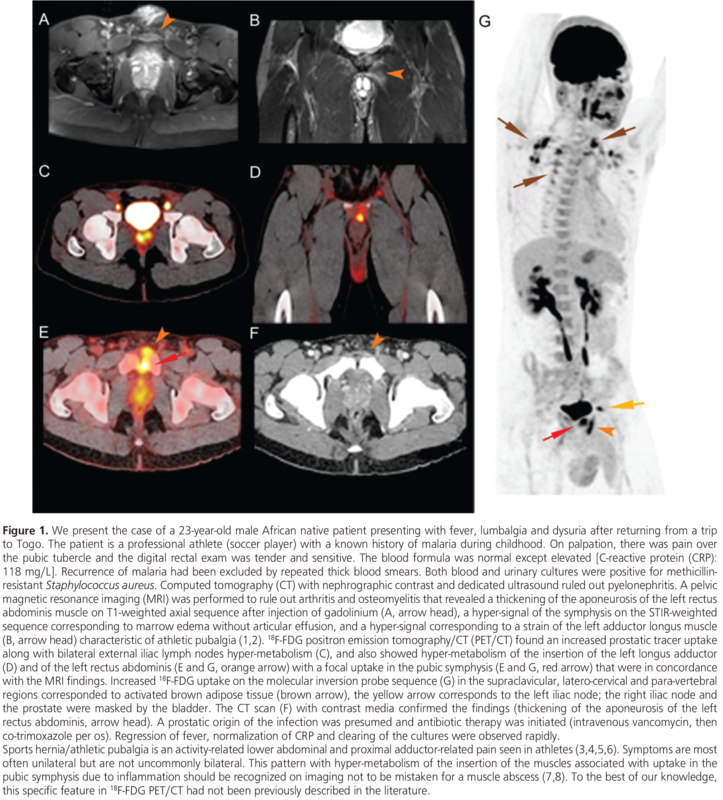 An 18F-FDG positron emission tomography/computed tomography supported the diagnosis of prostate infection and showed a focal uptake of the pubic symphysis, with diffuse hyper-metabolism of the insertions of the rectus abdominis and longus adductor muscles, corresponding to athletic pubalgia. Fever and CRP responded rapidly to antibiotherapy. Surgical and Medical Practices: O.R., M.P., G.A., Concept: O.R., G.A., Design: O.R., G.A., Data Collection or Processing: M.P., E.A., V.G., Analysis or Interpretation: O.R., V.G., G.A., Literature Search: O.R., M.P., E.A., V.G., G.A., Writing: O.R., M.P., G.A. McArthur TA, Narducci CA, Lopez-Ben RR. The role of pubic symphyseal CT arthrography in the imaging of athletic pubalgia. AJR Am J Roentgenol 2014;203:1063-1068. Brennan D, O’Connell MJ, Ryan M, Cunningham P, Taylor D, Cronin C, O’Neill P, Eustace S. Secondary cleft sign as a marker of injury in athletes with groin pain: MR image appearance and interpretation. Radiology 2005;235:162-167. Larson CM. Sports hernia/athletic pubalgia: evaluation and management. Sports Health 2014;6:139-144. Minnich JM, Hanks JB, Muschaweck U, Brunt LM, Diduch DR. Sports hernia: diagnosis and treatment highlighting a minimal repair surgical technique. Am J Sports Med 2011;39:1341-1349. Munegato D, Bigoni M, Gridavilla G, Olmi S, Cesana G, Zatti G. Sports hernia and femoroacetabular impingement in athletes: A systematic review. World J Clin Cases 2015;3:823-830. Ellsworth AA, Zoland MP, Tyler TF. Athletic pubalgia and associated rehabilitation. Int J Sports Phys Ther 2014;9:774-784. Reyhan M. Post-traumatic psoas abscess diagnosed by 18F FDG PET/CT. Rev Esp Med Nucl Imagen Mol 2014;33:314-315. Alqahtani SM, Jiang F, Barimani B, Gdalevitch M. Symphysis pubis osteomyelitis with bilateral adductor muscles abscess. Case Rep Orthop 2014;2014:982171.